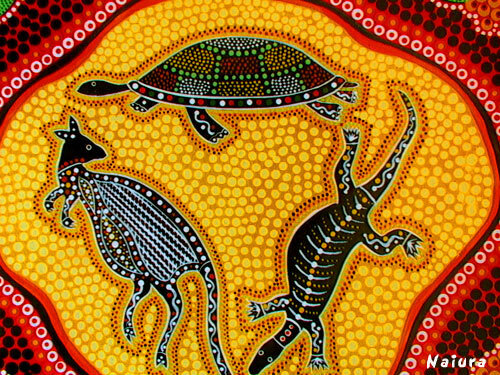 There are numerous art galleries and shops with wonderful aboriginal art in Sydney. These snakes are from a gift wrapping paper I bought in a gallery in Sydney. A post card I bought in Sydney. From a package with envelopes and letter paper. 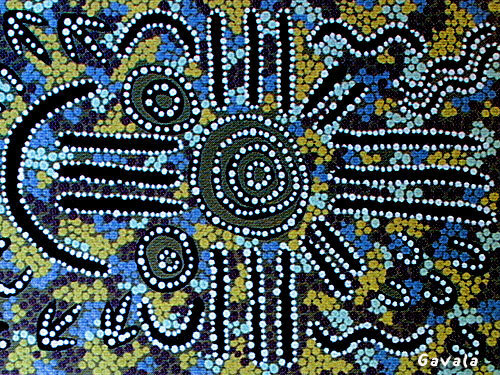 Gavala Aboriginal Art Centre at the harbourside Shopping Centre in Darling Harbour, Sydney, is Sydney's only aboriginal owned Art Centre. 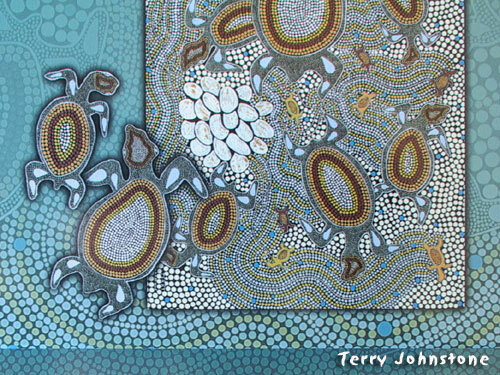 This picture is from their pamplet about the shop which was established in 1995 by a family of Aboriginal artists. Beautiful art centre! Open every day, also in the weekend, from 10am to 9pm. C. Dan Purches, whose tribal name is Naiura, learned his art through his mother. His maternal grandfather was a member of the Burramadagal clan of the Dharrug tribe. His people frequented the Parramatta River area of New South Wales. Naiura's mother spent many hours telling him stories that were handed down from her ancestors. This textile cloth I bought at a market shop at the Wollumbin Festival, Aus$ 40. 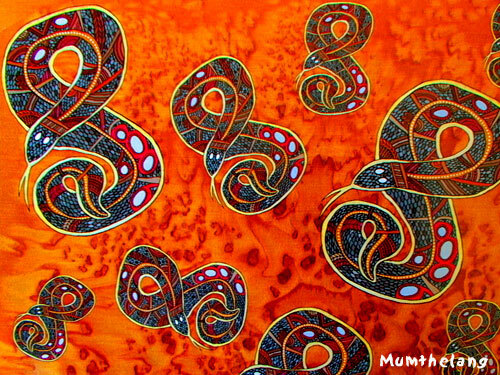 The Indij-N-Arts artists are from the Bundjalun and Kamilaroi tribal areas of New Soouth Wales. 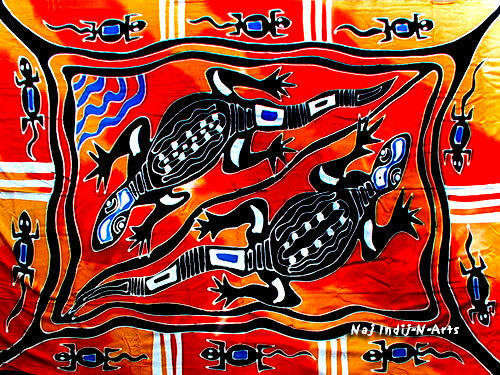 Their art is influenced by their peoples connection to the land, ocean and rivers where they live. 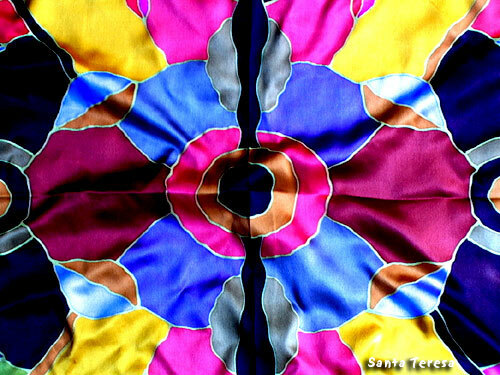 Silk textile  purchased at an aboriginal art gallery in Sydney. In the edge of the cloth, it is written: June S. Keringke Arts. Santa Teresa. N.T. 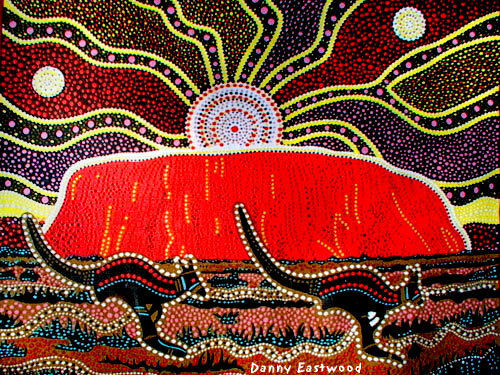 "91"
My new shopping bag is illustrated by Danny Eastwood, Uluru, Aboriginal Art Australia.